A surprise playoff team last season, the Rangers will need good health and a little luck to get back to the postseason in 2016. This week, SI.com is previewing all 30 MLB teams for the 2016 season, counting down to the No. 1 team in the league. At No. 10: the Texas Rangers. You could make the argument that the Rangers, who were under .500 as late as Aug. 13, lucked into the postseason dance last year. They outperformed their third-order wins by nearly eight wins and posted the AL’s seventh-best run differential. There’s no denying, however, that by summer’s end, Jeff Banister’s crew—with Cole Hamels stepping into the role of staff ace, with Shin-soo Choo and Adrian Beltre healthy, with Prince Fielder and Mitch Moreland raking, with a lights-out bullpen—looked like one of the most dangerous teams in the AL; Texas was, after all, one win from reaching the ALCS. When the Rangers added Hamels at the trade deadline (a deal that at the time seemed aimed at 2016 and beyond), they knew they were getting a front-line starter, and the lefty was as advertised after arriving from the Phillies. With Hamels back in a rotation that by late May should include Yu Darvish, Martin Perez and Derek Holland, the Rangers have a chance to have one of their deepest rotations in years—maybe ever—if everything breaks right. Never in previous playoff runs did Texas have a one-two punch of the caliber of Hamels and Darvish, who is on schedule to return from Tommy John surgery in May and, when healthy, is as filthy as any pitcher on the planet.Hamels at the trade deadline (a deal that at the time seemed aimed at 2016 and beyond), they knew they were getting a front-line starter, and the lefty was as advertised after arriving from the Phillies. With Hamels back in a rotation that by late May should include Yu Darvish, Martin Perez and Derek Holland, the Rangers have a chance to have one of their deepest rotations in years—maybe ever—if everything breaks right. Never in previous playoff runs did Texas have a one-two punch of the caliber of Hamels and Darvish, who is on schedule to return from Tommy John surgery in May and, when healthy, is as filthy as any pitcher on the planet. The bullpen should be a strength as well. A big reason for the Rangers’ surge late last season was—and this is where the work of Banister, the AL manager of the year, stood out—the remarkable improvement in the relief staff, which went from the worst in the AL to the sixth best after the All-Star break. The unit could be elite again, with Shawn Tolleson, Sam Dyson, Jake Diekman and Keone Kela all returning. The Rangers finished, somewhat unexpectedly, third in the league in runs, thanks to career performances from the likes of Moreland, Delino DeShields, Jr., and Robinson Chirinos. While all three are regression candidates, the biggest reason to be nervous comes with the veterans in the lineup: Perpetually injured Josh Hamilton turns 35 in May (the hope is that he will be able to come off the disabled list at the start of that month), Choo turns 34 in July, Fielder will be 32 in May, and future Hall of Famer Beltre, approaching his age-37 season, is showing signs of slowing down (last season, he posted his worst OPS+ in six years). But you can put Darvish, who’s made a total of 22 starts over the last two years, at the top of the Rangers’ long list of injury concerns; if there are any issues in his recovery, Texas’ chances to repeat as division champs obviously take big hit. The Rangers went from a 91-win team to a 75-win team two years ago when they were completely decimated by injuries—in 2014, Texas players lost a remarkable 2,100 days to the disabled list. While bad luck on that scale is unlikely, staying healthy will clearly be key for a team full of players who can’t seem to stay healthy. To much fanfare, Gallo made his arrival in Arlington last summer, and the faithful were immediately treated to a Ruth-ian show, as the 22-year-old masher (who has hit 105 home runs in the minors since 2013) blasted monster home runs in his first two games. The raw Vegas-bred power was jaw-dropping, but the problems in his approach quickly became obvious, too. Gallo struck out way too much: 57 times in just 108 at-bats, and according to Fangraphs, he posted the highest swinging strike rate of anyone with at least 100 plate appearances over the last five years. But despite all his flaws, Gallo remains one of the most fascinating prospects out there because of his power. Gallo will start the season in the minors, at Triple A Round Rock, and he could very well stay there most of the season. 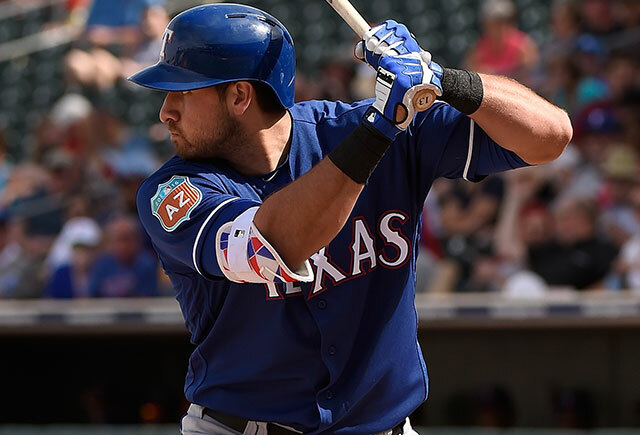 But because the Rangers have injury-prone and aging starters at third base and in left and rightfield, Gallo—like fellow youngsters Nomar Mazara and Jurickson Profar—could also be taking meaningful cuts in Arlington this summer. That's how many home runs were hit by Rougned Odor, the second most ever by a second baseman under the age of 22 (Bill Mazeroski, at 21, had 19 in 1958.) Odor was the Rangers’ big breakout player of 2015, and he left a mark on the postseason, too, becoming the third-youngest player to homer in his first playoff game. Odor was probably rushed to the majors in 2014, at 20 years old, and he struggled to start '15 before he was sent to Triple A in May. After his June recall, he hit a superb .292/.334/.527, and he could be on the verge of a star-making season. "He has not fulfilled the potential that most baseball people thought he would—he has the talent and skill set to be a superstar." "Any time a guy is a 17-game winner and he's still considered a fifth starter? There are No. 1s who don't win 17 games."